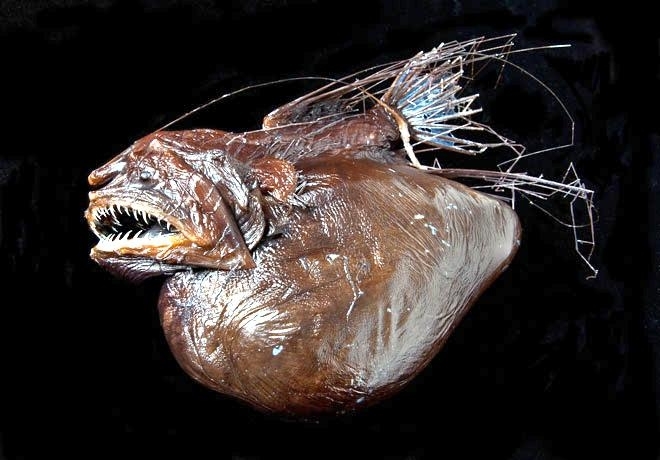 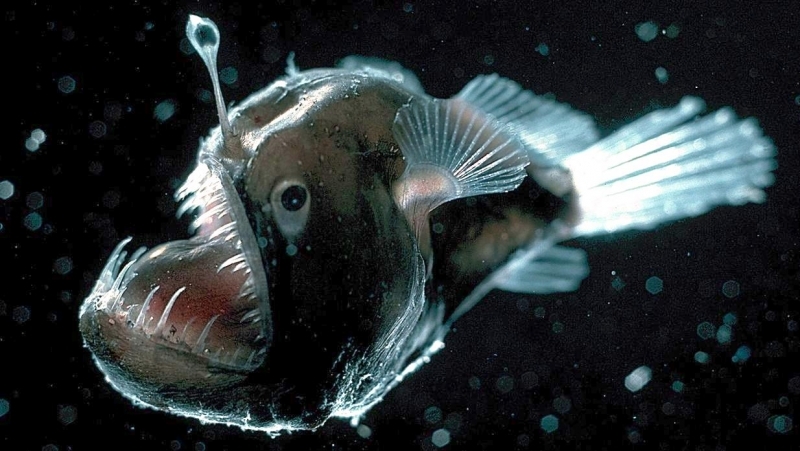 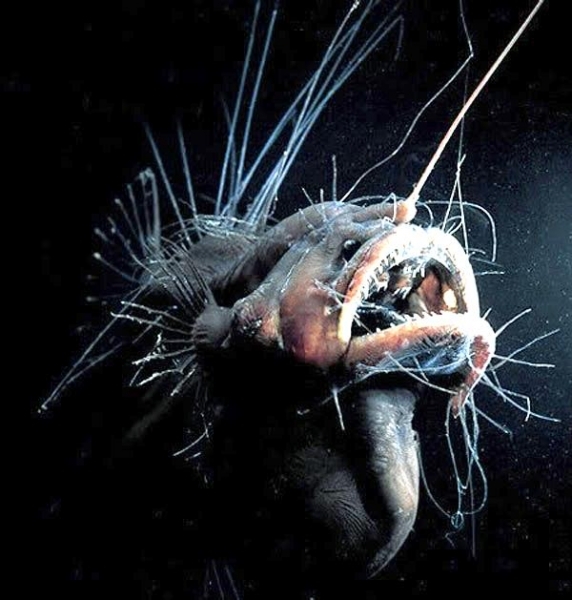 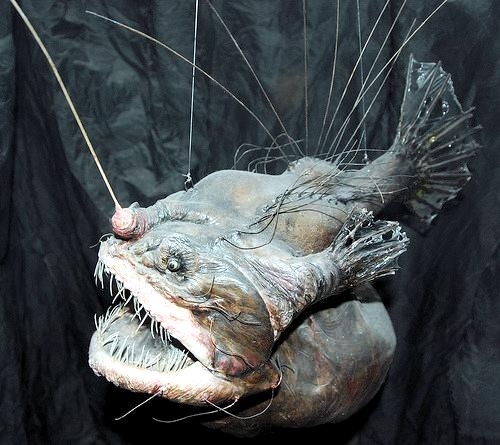 The Anglerfish is widely considered as one of the most bizarre deep-sea inhabitants. 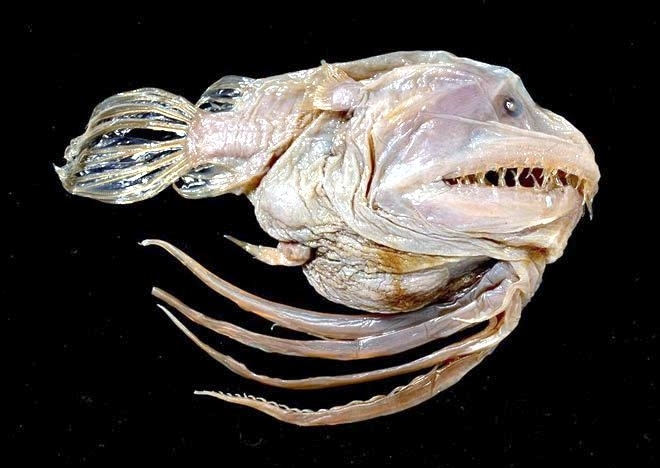 Most who have seen it find it the ugliest creature on planet. 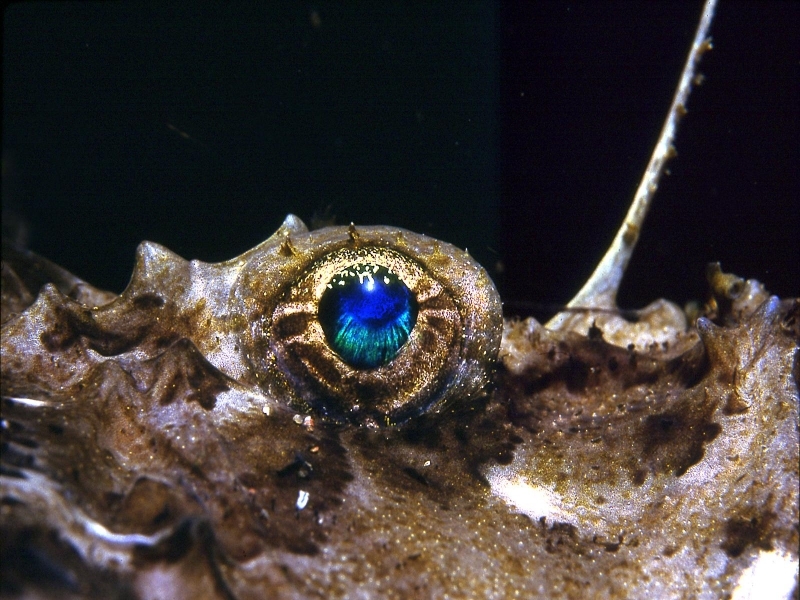 But despite its looks, it is an incredible example of adaptation and survival in most extreme environment. 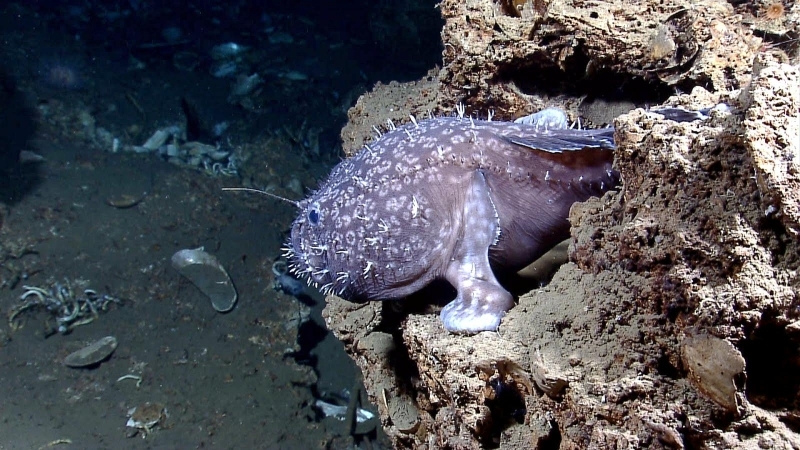 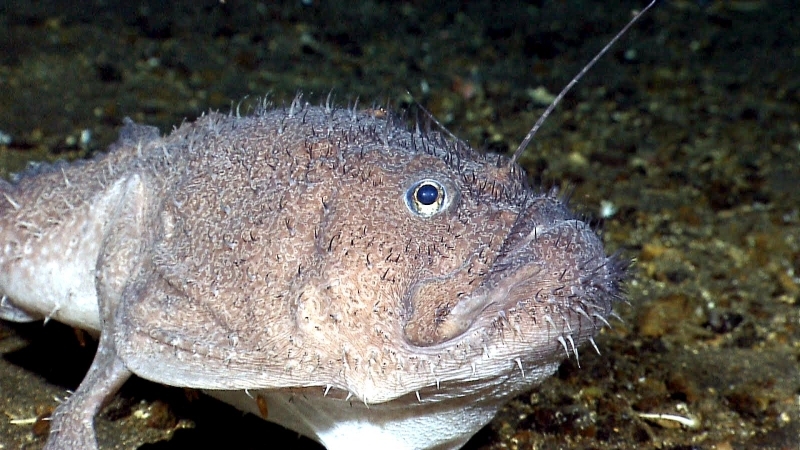 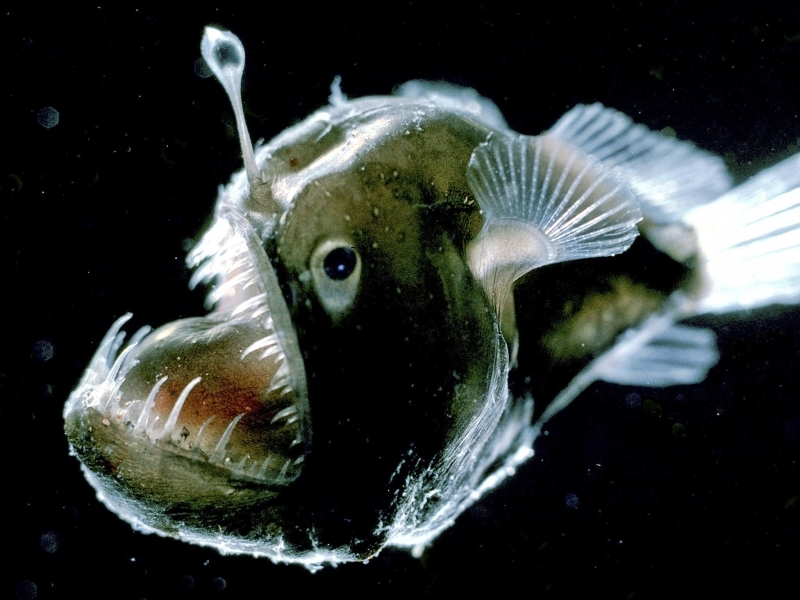 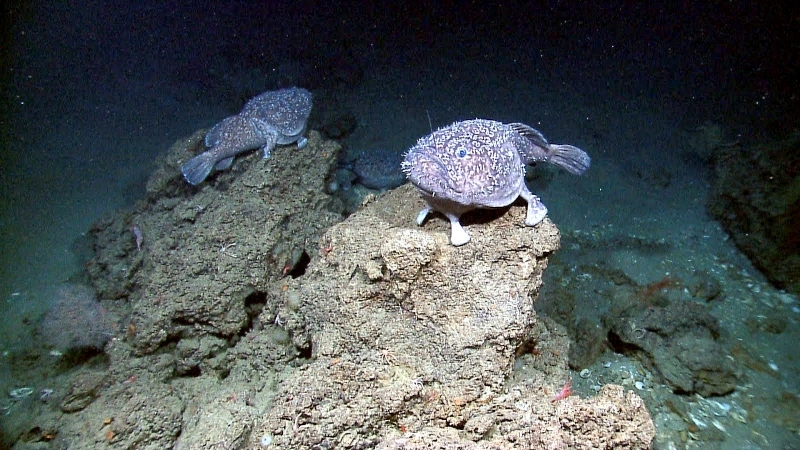 Named after its prey luring method, Anglerfish usually lives 1 mile on average, below the surface where the water is freezing and light is scarce. 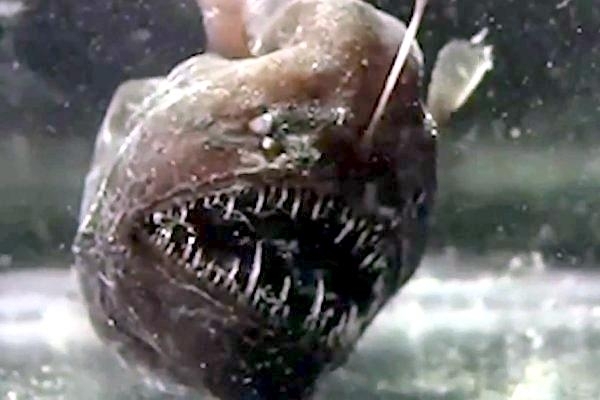 Ranging in color from dark gray to dark brown, these carnivores have huge heads with enormous crescent-shaped mouth filled with long, fangs-like teeth angled inward for efficient prey grabbing. 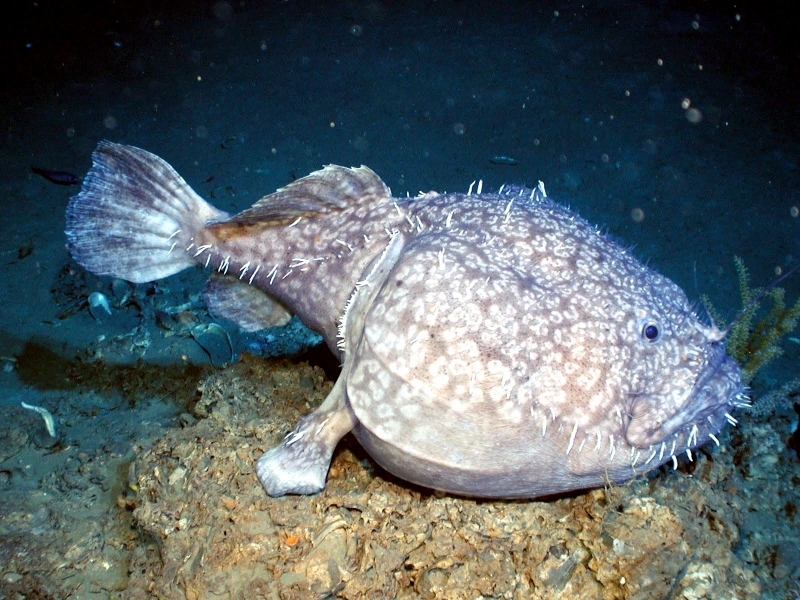 Their length can vary from 8 inches (20 centimeters) to over 3 feet (1 meter) with weight of up to 100 pounds (50 kilograms). 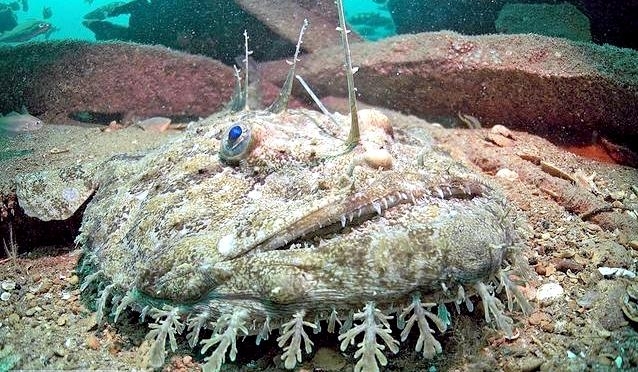 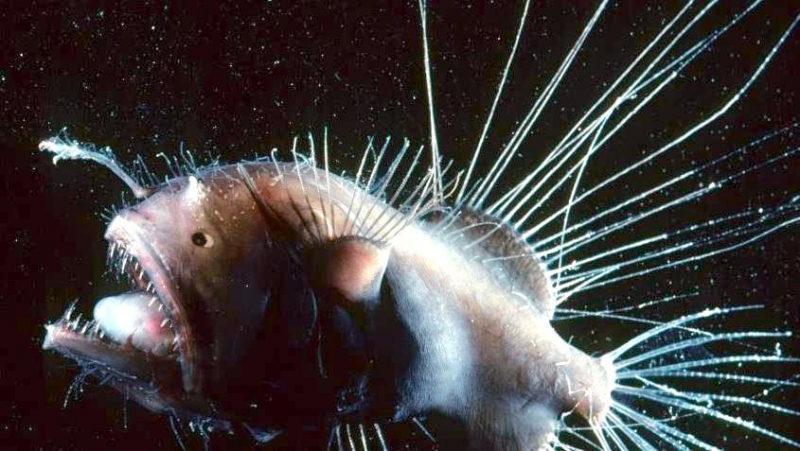 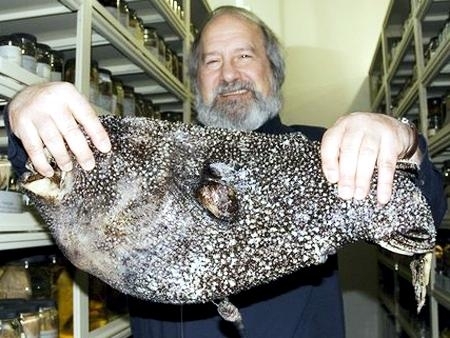 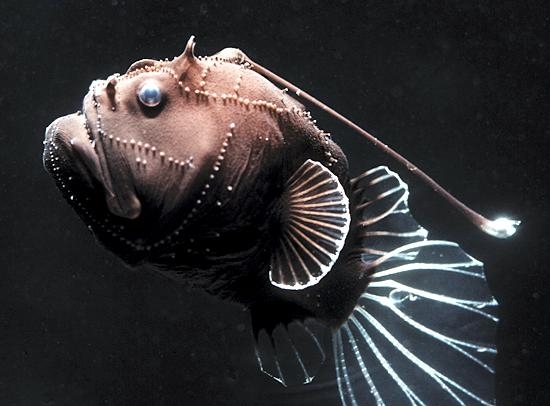 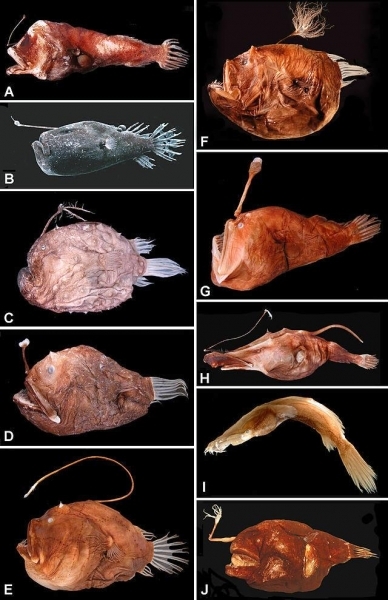 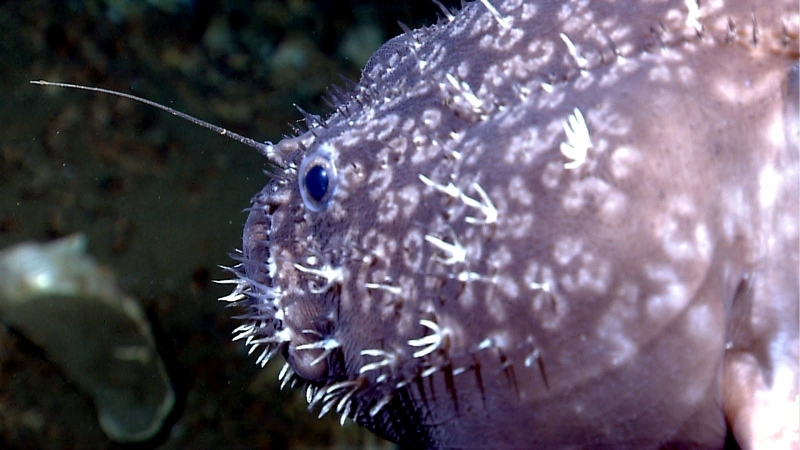 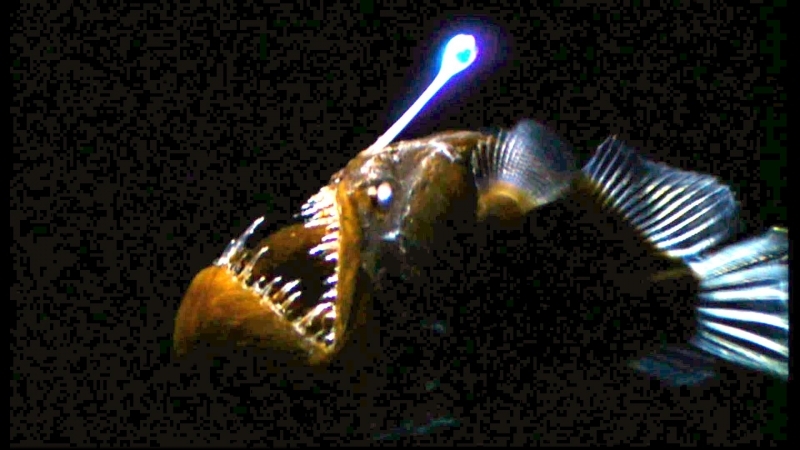 Most recognizable feature of an Anglerfish is a distinctive spine resembling a fishing pole sprouting from the middle of its head, possessed only by female specimens. 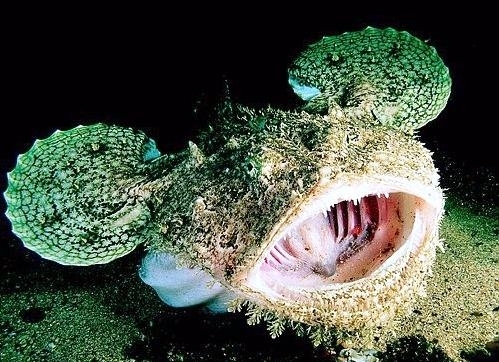 It is used to lure prey close enough to be captured & eaten by jaws snapping shut when contact with the spine is made. 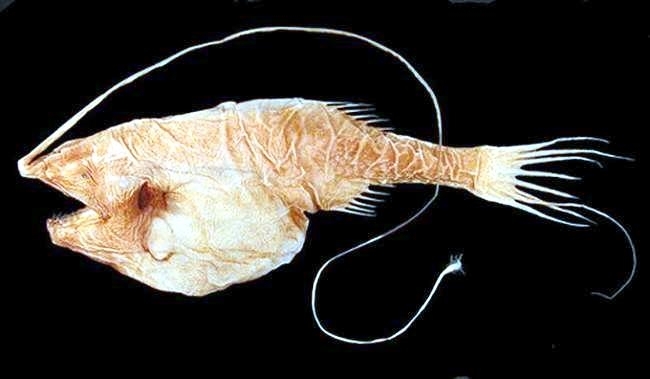 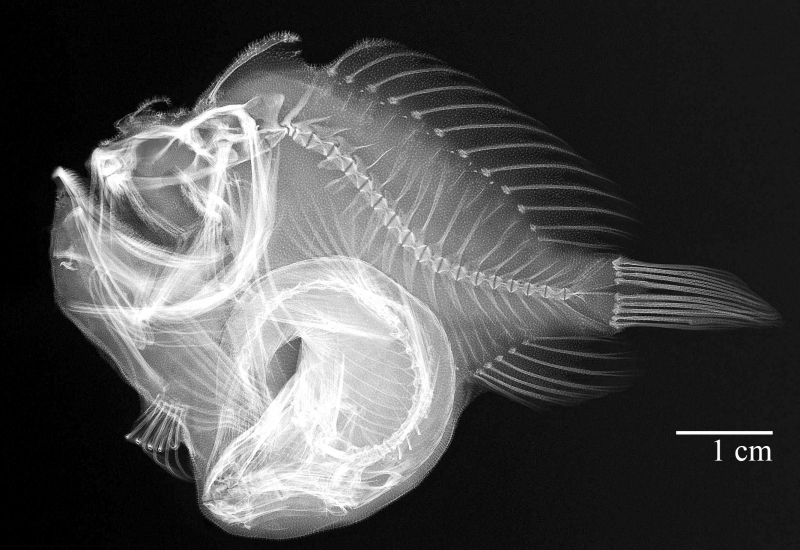 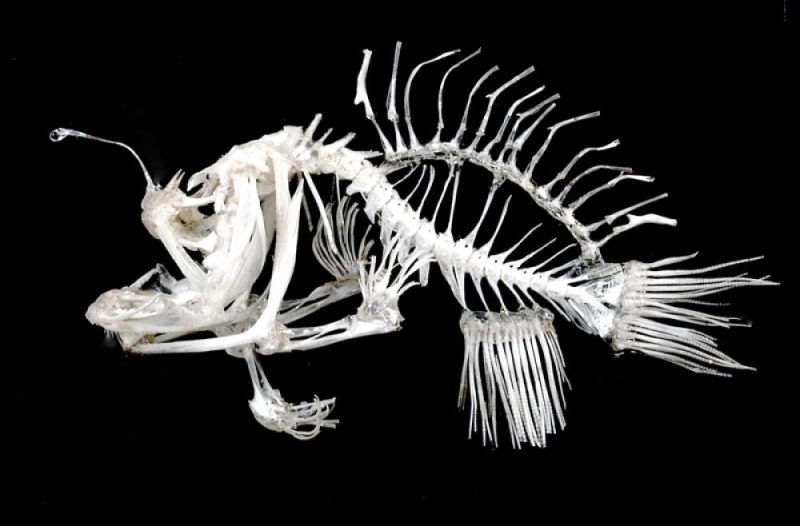 The skin & bones of the Anglerfish are very thin and flexible. 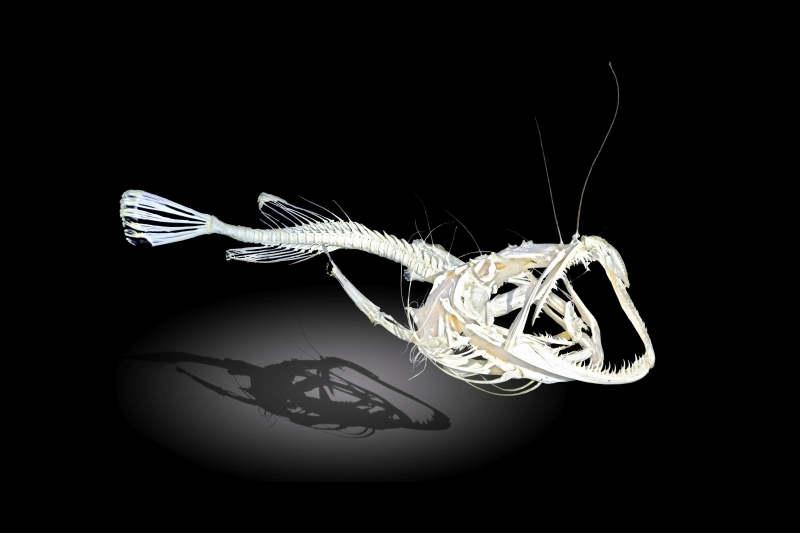 The skin can be peeled of with a mere touch of a human hand. 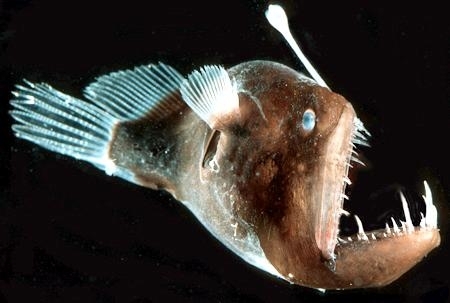 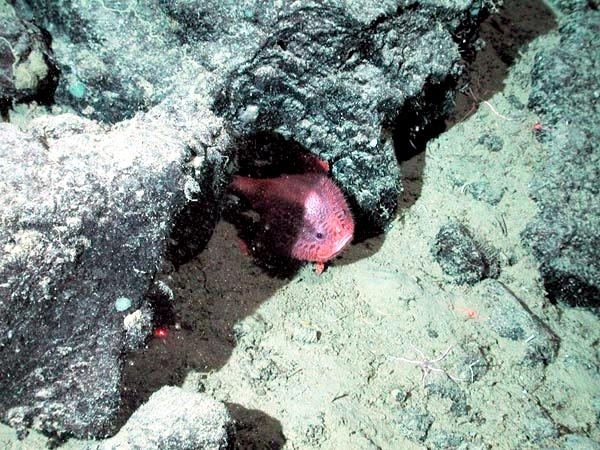 However, this allows them swallowing pray twice their own size, which is crucial as food is always scarce in deep-sea waters. 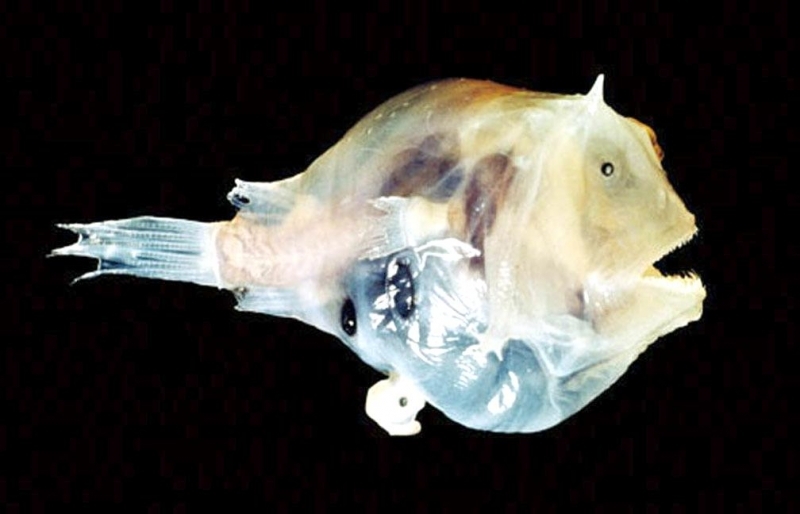 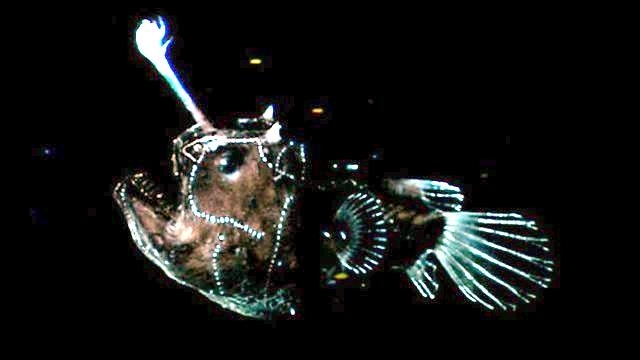 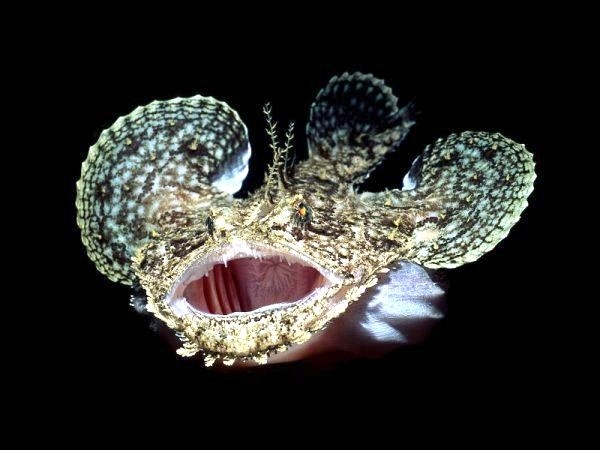 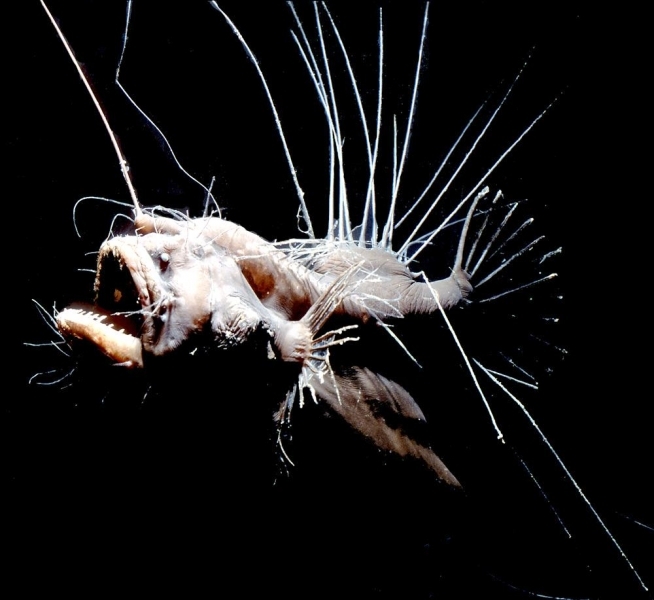 Anglerfish mating is one of the most extreme methods of reproduction known to science. 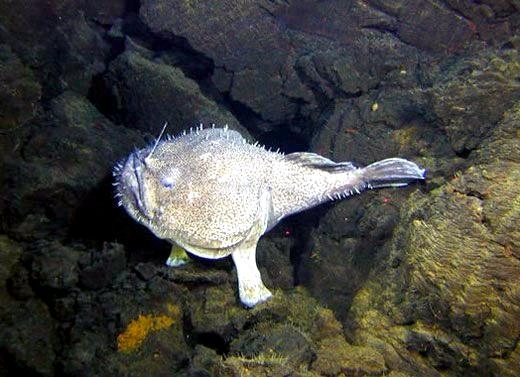 The male which is about 10 times smaller than the female, can no longer feed by itself after becoming mature as its digestive system stops working. 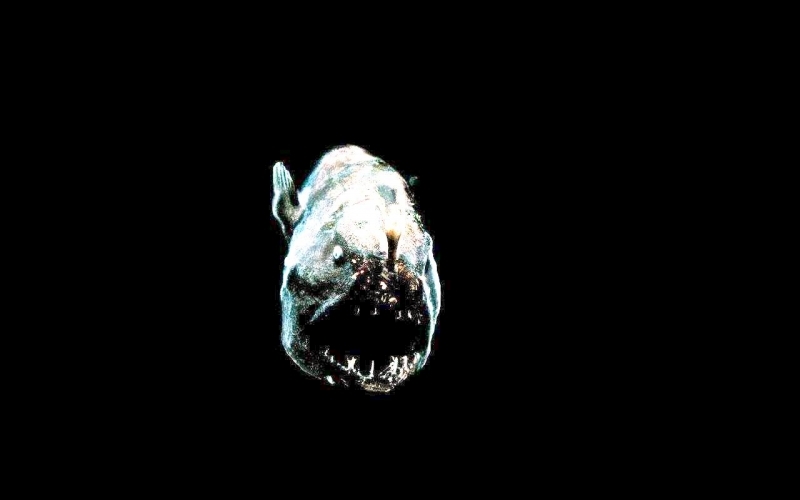 At this point, locating a female becomes a priority and the only way of staying alive. 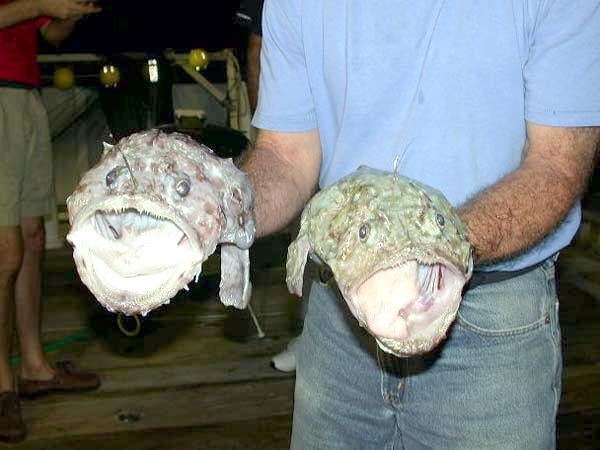 Once the mating partner is found by following sexual scent released by the female, this bizarre mating ritual begins. 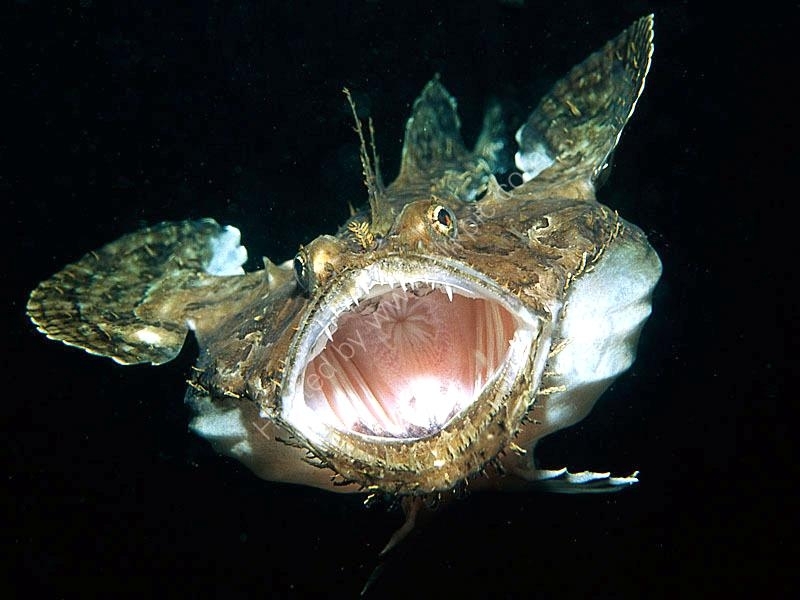 After hooking itself to the female with small teeth, the male releases an enzyme which digests the skin of his mouth and her body, enabling the fusion of 2 with male becoming a parasite as their blood vessels join. 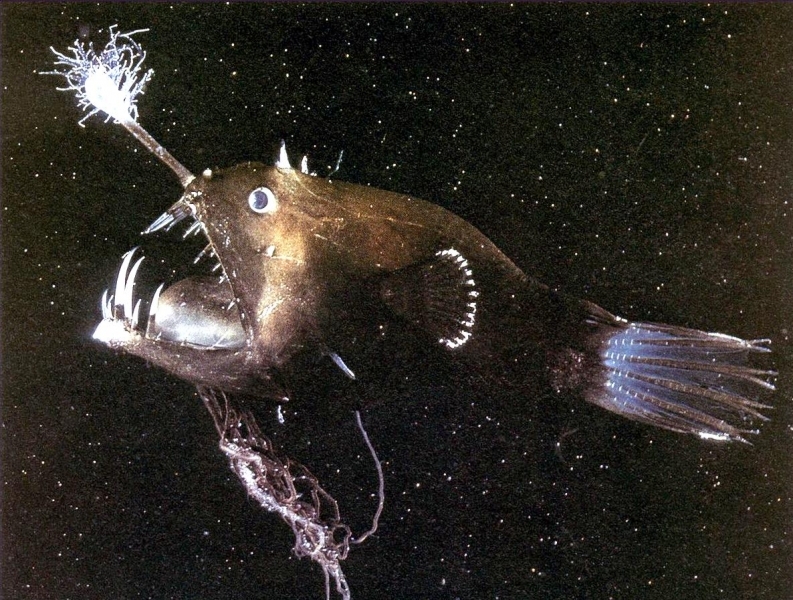 Ending up as a simple pair of sperm releasing gonads he is now totally dependent on the female for nourishment. 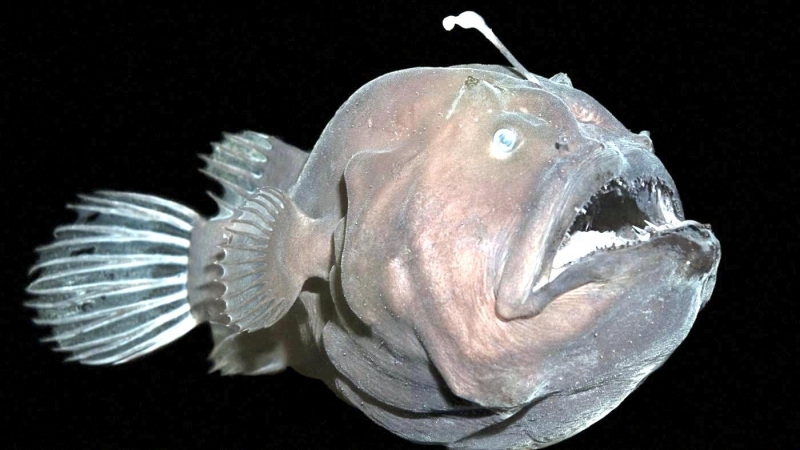 The female can carry up to 6 male specimens which makes sperm instantly available whenever she is ready to reproduce. 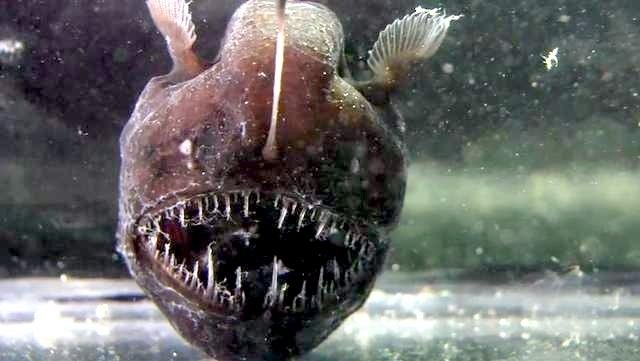 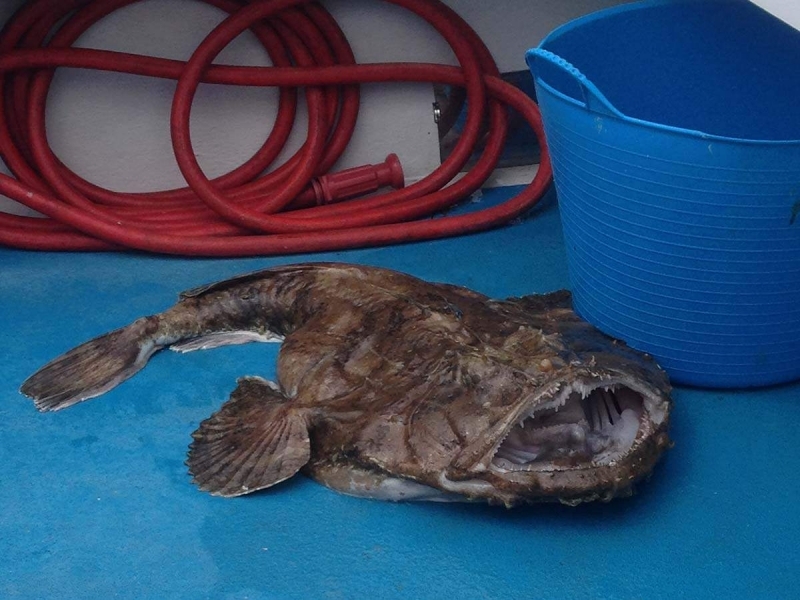 Despite its intimidating appearance, Anglerfish is considered a delicacy in Japan & Korea, fetching premium prices with lobster-like taste and texture. 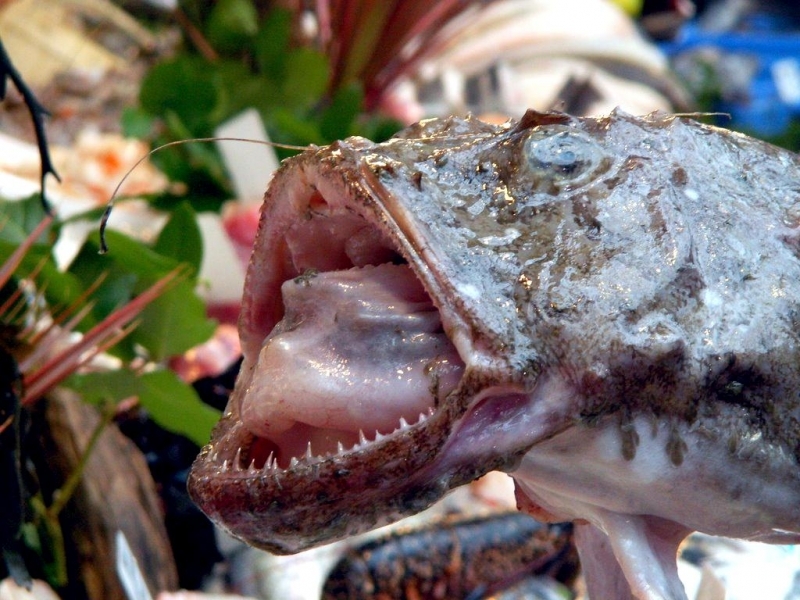 In Europe & North America, its tail meat is widely used in a number of exotic recipes.